Halifax coach Richard Marshall says his side will be taking on a Super League club in all but name when they face an ‘under pressure’ London Broncos in Ealing on Sunday (1.30). The two teams meet at Trailfinders Sports Club for a contest that could see Fax, 34-20 winners over Featherstone at the weekend, take a huge step towards a top four finish and a place in the lucrative Super 8s Qualifiers. A win would leave them needing just two points from their final two home games against Toulouse and Rochdale, while putting Danny Ward’s full-time outfit, who currently trail their visitors by two points, in a desperate situation. The game will kick off 90 minutes earlier than originally planned, to avoid potential clashes with the World Cup final. 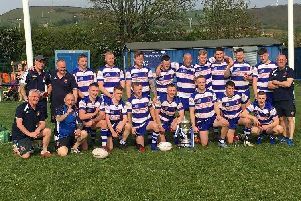 “We’ve given ourselves a chance and a win this weekend would leave us needing to win one of the last two,” said Marshall, who confirmed Fax would travel to the capital on Saturday after their final training session. “We want to be in the Qualifiers, playing those Super League teams, but we’re probably playing a Super League club in all but name this weekend. “They’re full time, they’ve got the budget, they’ve got the facilities and they’re probably under a bit of pressure this weekend, and rightly so. “We were under some pressure last week and we dealt with that pretty well. “This week, I just want us to go and enjoy it and bring the same physicality we brought to the Featherstone game, because I think that will do us a lot of good. “London are very strong at home and there are a few factors that make it a difficult place to go; the travel, the plastic pitch, all that. “We can deal with everything; this group of players don’t really get fazed by that stuff or who they’re playing again, they’re just very professional and very methodical. Marshall said he hopes to be able to name an unchanged side, although he admitted the brutal nature of the win over Rovers has taken its toll. “It’s not going to be a case of keeping the players grounded after Featherstone, it’s going to be a case of lifting them up again,” said Marshall, a former Broncos player. “Sunday was tough; there was a lot of fatigue and some sore bodies on Tuesday night. “We had a very light training session and took a look at what London do and then we’ll wind things up a bit towards the back end of the week. “Will Maher hurt his shoulder, but he thinks he’ll be okay to play, and we’ve a couple of other bumps and bruises. “Hopefully they’ll all come through okay and all being well I can’t see many, if any, changes to the team. “London have got some good players; I’m expecting Jarrod Sammut to play, so he’s always dangerous, and I like the full back, Walker, and Ioane in the front row. “They’re a strong, strong side - they stuck 50 points on Swinton the last time they played at home, which isn’t an easy thing to do - and they’ll certainly present us with different challenges to Featherstone.